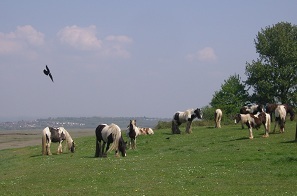 Penclawdd is famous for its cockles, and faces a tidal estuary, populated by sea birds and marsh ponies; with views which constantly change with the light and the height of the tide. On the other side of the estuary is the Llanelli Wildfowl and Wetlands Centre. We are on the main road through the village, (easy to find), but set well back from the road behind the chapel ensuring peace and quiet. The house is set in a pretty garden, with plenty of private gated parking. We are only 10 minutes drive from the M4, and 10 minutes drive from Swansea airport on Gower. 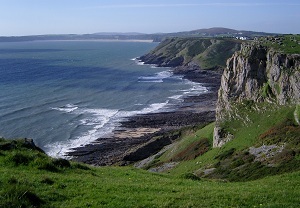 Good access to all of beautiful Gower – the first area in which the National Trust bought coastal land. Gorgeous beaches, cliff walks, and moorland with wild ponies, are all nearby, and a variety of visitor attractions.The public rights of way network on Gower is an extensive 268 miles. Garden-lovers can easily visit Aberglasney Garden and the Welsh Botanic Garden. Nearby Swansea offers restaurants, the Marina, the Dylan Thomas Centre, Waterfront Museum and Glyn Vivian Art Gallery. See local attractions page for further information. Penclawdd is a medium sized village with a post-office, doctors, dentist, hairdresser, small supermarket, butchers and pharmacy. an excellent fish & chip bar, a take away tandoori, and a small café in the local supermarket. This is a lovely area for walking, there is a Wildfowl and Wetlands Centre just across the estuary, and fishing competitions are also held locally, so we are happy to cater for the needs of walkers, birdwatchers, fishermen and cyclists.